SWD Inc. provides its customers with the most comprehensive array of fastener sorting services and equipment available in the industry today. Optical, eddy current, laser, and machine vision equipment are used to remove defective, foreign or mixed parts from production lots. SWD Inc. runs the widest variety of sorting machines in the industry to give our customer's the best possible sorting option to meet their needs. SWD Inc. is equipped to assemble washers, principally steel-backed neoprene and internal-toothed vinyl sealing washers, on screws and bolts ranging from #10 x 1/2" to 3/8 x 1-1/2"
Knowledge of fastener sorting within the fastener manufacturing industry appears to run the gamut from extensive familiarity with different types of machinery and their specific capabilities, to none at all. Somewhere within the continuum is that special group who has heard the term laser sorting and perceives sorting with a laser or lasers to be the panacea that will finally get those zero defect zealots off their backs. But more about that later. We'll avoid the usual semantical bog of sorting versus inspection. Whether a machine is "inspecting" using dimensional specs, or "sorting" via attributes, in the end it's separating or sorting bad parts from good parts, so for this article, "sorting" will suffice. Besides, the production, Q.A., and sales people whose customer has a line going down don't care a bit what it's called. They just need parts. There are several reasons why parts might require sorting. Outside process operations may introduce foreign material from material handling equipment into a production lot. Or problems can develop at the source. Any number of defects can be generated in the manufacturing process - filled recesses, over or under length, cracked heads, mixed materials, ball caps, run-up threads, etc., which compromise the quality of a production lot. Defective parts will ordinarily need to be sorted out. Because of both of the above possibilities, end users may specify sorting of their parts as a routine order specification. In this case, the sorting is precautionary rather than specific-defect directed. A fourth reason for sorting is to enhance the quality of imported fastener orders to which the axiom "you get what you pay for " might apply. This is occasionally successful for the supplier trying to satisfy a customer who wants domestic quality at imported prices. However it's not uncommon in these cases for the cost of sorting to exceed the cost of the parts. There is a variety of sorting equipment available utilizing diverse technologies. 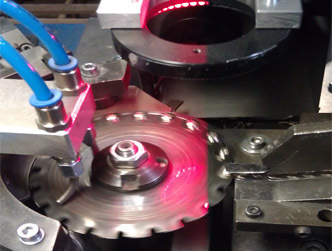 Counter-rotating rolls, optical systems using LEDs and magnified images, eddy current, sound waves, lasers, and vision (utilizing cameras - not to be confused with human eye vision as in hand sorting), are used either alone or in various combination to remove defective, foreign or mixed parts from production lots. Computers are essential components on several of these types of equipment. Machine prices range from around $5,000 for a roll sorter up to well into six figures for sophisticated multi camera vision machines. How often will the equipment be used? Will it be used in a dedicated environment or will it be required to sort a wide range of different parts? Is there competent staff available to operate and maintain the equipment properly? Will it sort for all fastener parameters, or if not, which ones is it capable of detecting? What level of accuracy or machine capability is required now and is likely to be required in the future? What is the reputation for reliability of the machine? Does the initial purchase price, reputed throughput and capability make economic sense? As an independent sorting job shop, SWD Inc. Fastener Sorting Corp. operates eleven specific types of machines. Obviously we haven't yet found the machine that provides the correct set of answers to the above questions. sorted"), referred to above, laser-based equipment does a fine job on some parameters - we wouldn't want to be without ours. There are some jobs that can only be sorted on a laser machine. But, like all other types of equipment we've encountered to date, laser isn't comprehensive either. Some parameters can't be sorted by laser. Other types of machines are more appropriate choices in some cases. Why raise the issue? Certainly not at all to criticize laser equipment, but rather because of the number of calls we receive, similar in tone to the example above, which reflect a perception that sorting via laser beams is the equivalent of a medical MRI, that laser equipment will check everything it sees with great detail and will reveal all flaws. At the present time, that's an unrealistic expectation of any type of machine. some purchase orders reflect the same thing. The instructions read "Laser Sort". Because the equipment is not comprehensive, the question to be answered is, what parameters are to be sorted for? Filled recesses? Broken punches? Length? Head diameter within .002? Laser sorting might be the appropriate operation. Maybe not. Without clearly stated requirements, no one can tell. The reference in the opening paragraph to zero-defect zealots was mostly tongue-in- check because zero-defects must be the continuing goal of any entity seeking to improve their product or service. Of course, horror stories abound in the industry about rejections for two or three parts per million, command appearances halfway across the country for what might seem to be a trivial defect, nightmare audits, etc. It's easy and natural, even frequently justified, to bemoan these experiences. But no one wants one of those two or three parts per million to be a component of the air bag assembly that most of us sit in front of at least two times a day. And so the quest goes on for the elusive zero defect goal. Any technology or technique that can be exploited to make it happen will surely be employed. If the screw size or specifications fall beyond our machine capabilities, SWD Inc. is always willing to help out our customers and do what ever it takes to get the job done with complete satisfaction. Please call (630) 543-3003 for a quotation.